CSUN’s one-two punch was everything it was supposed to be, but so was the University of Hawai’i’s team approach. 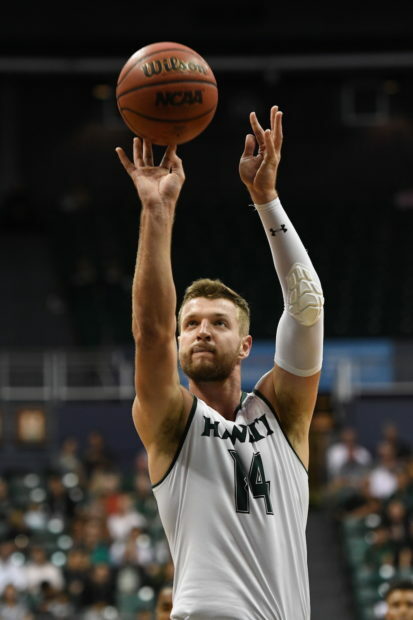 As a result, the Rainbow Warriors earned an 84-79 road win over the Matadors on Thursday at The Matadome in Northridge, Calif.
Four Hawai’i players scored in double-figures in an efficient performance that kept the Warriors unbeaten in the Big West Conference. Hawai’i, which has now won five in a row, improved to 11-5 overall and 2-0 in the Big West. CSUN dropped to 8-11 and 2-1. 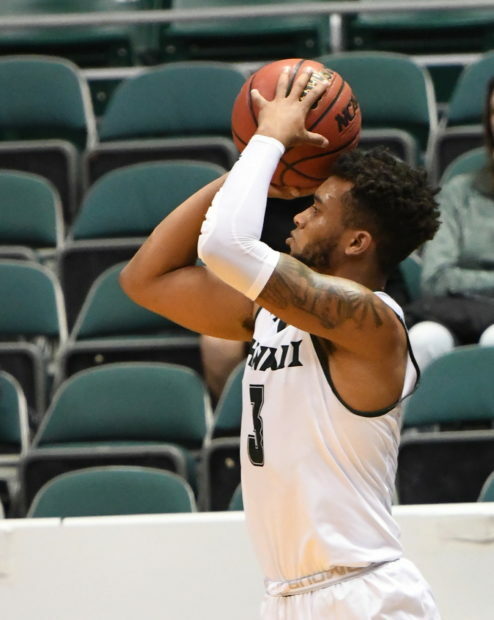 Northridge has actually been a kind road stop for Hawai’i, as the Warriors have now won five consecutive games in The Matadome. Juniors Eddie Stansberry and Zigmars Raimo led the way, combining for 46 points. Stansberry hit four 3-pointers and finished with 25 points; Raimo shot 7-for-11 from the field and scored a career-high 21 points to go with a team-high 11 rebounds. Jack Purchase added 13 points and five rebounds, Samuta Avea scored 11, and Drew Buggs for 6 on free throws in the final 17 seconds to secure the win. CSUN’s young duo of freshman forward Lamine Diane and sophomore guard Terrell Gomez played up to their hype. Diane finished with 28 points and 16 rebounds – his 11th double-double of the season – and Gomez scored a game-high 30 points, including 7-for-12 shooting from 3-point range. Hawai’i opened the game with a 7-0 lead, and led by as many as 15 points in the first half. CSUN closed the first half with a 10-2 surge to cut the UH lead to 44-37 at intermission. The Matadors opened the second half with a 14-5 surge, and had a short-lived 51-49 lead with 15:55 remaining. Hawai’i countered with an 11-2 surge to regain the lead at 60-53. Avea capped the run with a steal and breakaway dunk with 9:47 remaining. The Warriors stayed in front the rest of the game, and led by as many as 11 with less than three minutes remaining. The Matadors made it exciting in the closing minute, with Gomez hitting two 3-pointers from NBA range in the final 20 seconds. Hey, that’s a pretty good win! And a road win no less! Great win against a tough opponent on the road! That Gomez dude was amazing, his range is crazy. He made it close in the end there but the Bows hung on. One observation is I’d like to see a little more consistent free throw shooting from Raimo! With his umpteenth double-double performance, he’s going to continue getting trips to the line so he needs to make sure he can capitalize on it!! Purchase and Eddie were clutch! Samuta had some nice steals. Drammeh had an off game but it didn’t matter. Hopefully they can carry this momentum into Saturday and make it a road sweep! Let’s go BOWS!!! In the past 2 or so years, I haven’t posted much about UH mens basketball. Although I like how this team plays, I’m worried about the lack of good depth on this team, especially when it comes to athleticism in the front court. No more Mike Thomas, Noah Allen, Aaron Valdes type of players who slash to the basket and can play defense against the opponent’s best scorers. I’m not sure Samuta Avea is quite there yet, but he’s a year away. He does reminds me a little of Valdes and Carl English roll into one. But nonetheless, this team passes pretty well and have some really good guards who can handle the ball. I’m optimistic about Saturday. Road wins are never easy. Our Warriors prevailed. ! Kudos to our coaches to prepare the team. Csun has two unreal scorers. Raimo and Stansberry came through and Avea made two critical free throws. I would like to see Buggs score at least 12 points and 6-8 assists or more per game. He’s our steady rock. Great performance by the. Team. Onward to Riverside ! Go Warriors! Agreed, this is a really big win for this team. Stansberry is the missing player that this team needed last year. He’s a knockdown shooter who is perfect for getting the passes of the offense. I see CSUN sinking to the lower level of the conference sooner or later (but watch out for them next year if Diane comes back). Riverside is already at the lower end so I expect another UH victory tomorrow. Basically, these are two road wins UH needs to get to be a contender.